Are you looking foe an electrician in Salem, MA? Then look no further At Talbot Electric we have built our company around the commitment of fulfilling our customers needs based on the highest quality. We have been servicing the Salem, MA and and North Shore area since 1984 and we know what it takes to complete your electrical installation in a professional and timely fashion. We started our business with the intention that quality is more important than quantity and our customers satisfaction is our #1 priority. 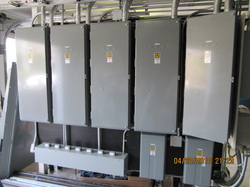 Just a few of the services we offer is complete electrical work that includes new construction, interior build outs and retrofits, whole home or business surge protection, electrical panel and lighting upgrades, emergency backup generators that make sure you are up and running in the time of a crisis, landscape and security lighting, electrical property maintenance, and parking lot lighting repair. Call Talbot Electric for all of your home electrician needs. We are a fully licensed, bonded, and insured electrical contracting firm designed to meet your needs. Whether it’s a blown fuse or adding an addition to your home, one quick call to Talbot Electric is all you need.